Exclusively Offered by The International Institute of Weddings, become a Certified Wedding Floral Designer™ – a trademarked designation you can only receive through the Wedding Floral Design Course by Institute of Weddings. 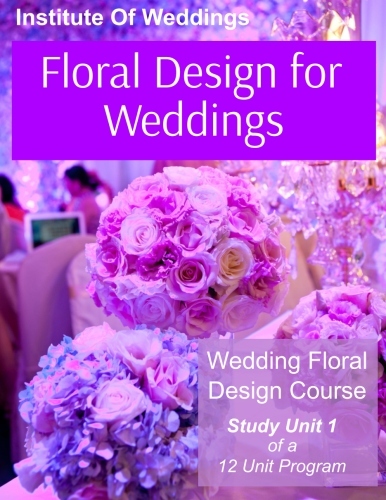 This highly specialized 12-Unit Wedding Floral Design course is the first and only program available anywhere in the world to offer distance education focusing exclusively on designing flowers for weddings. Do you have an interest in floral design and a passion for weddings? The Wedding Floral Design Course by the International Institute of Weddings is a highly specialized distance education course focusing exclusively on wedding floral design. That’s correct – exclusively wedding floral design. No funeral flowers or hospital arrangements like the lessons in so many other floral design courses – instead, we’ll focus intensively on designing flowers for weddings – and only weddings. After all, weddings are where the glamor and excitement is. 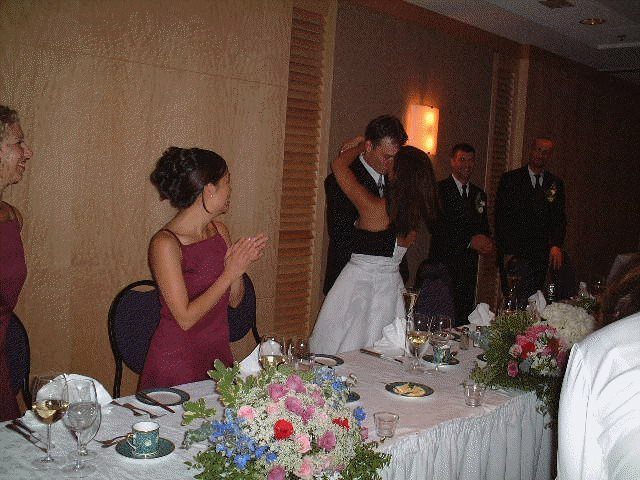 If your passion is weddings, funeral flowers simply won’t inspire you, so we’ve designed a program with laser sharp focus, for people just like you. And if you’re thinking of turning your floral design skills into a business, career, or even some extra income in your spare time, weddings are DEFINITELY where the money is. Better still, all training is done through distance education (also known as distance learning or home study) so that you can you can fit your training into your lifestyle; it won’t disrupt your existing schedule or time commitments. You can learn in the comfort and convenience of your own home, at a pace which is comfortable to you. Do your learning when you feel able to focus – on any day of the week, at any time of the day or night that works for you – not on someone else’s schedule. 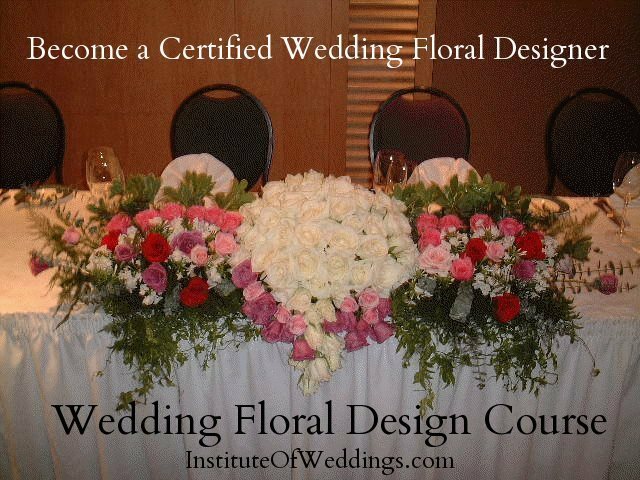 We give you one full year to complete the course and earn your certificate in Wedding Floral Design. This is more than enough time for anyone to complete it, however, if unforeseen circumstances prevent you from submitting the course work within the one year time frame, we are very reasonable and will consider extension requests with a valid reason on a case by case basis. Your extensive training materials for the Wedding Floral Design course include our huge training manual consisting of more than 500 pages, written in an interesting and easy to follow manner, featuring step-by-step instructions, photographs, diagrams and packed with all of the information you need for an exciting learning experience plus you’ll get online wedding floral design video demonstrations. Your course materials will promptly be shipped to your door once you register for the course. While you study the training manual and go through the lessons, the course instructor is available to support and assist you with anything you need at no additional cost (please make sure to whitelist the email addresses you a provided for course correspondence to ensure you receive all email course correspondence. If you don’t know how to whitelist email addresses in your email program, just ask us for assistance – we’ll he happy to walk you through the process). If you have questions, need advice, or want further guidance, help is just an email away. No need to travel to attend wedding floral design classes, you can do all your learning from the comfort of home. Every year, hundreds of highly satisfied students use our training programs to successfully pursue their dreams within the wedding industry. Since 1999 students have told us that our distance education training programs have changed their lives, opened up new doors of opportunity for them, and made it possible for them to achieve their dreams. That means so much us. Weddings are an awesome field – always filled with fun and exciting new experiences – and we take great pride and satisfaction in giving our students the specialized knowledge and skills they need to enjoy a future doing something they love in this exciting. We want to help you do the same; we are committed to your success, and to providing you with a rewarding and enjoyable learning experience. Pictured right: Our wedding floral design course has enabled students to open their own florist shops. This student and her two daughters enjoy the ability to share their passion for weddings and flowers with each other, and have found great reward in operating their “family business” together. 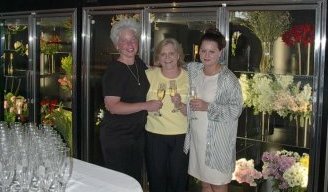 They opened for business shortly after completing our Wedding Floral Design Course and our Wedding Floral Business Course, and have been enjoying success ever since. After completing this Wedding Floral Design course, you can get a job as a wedding floral designer, open your own wedding floral business, do wedding flowers for friends of family – or simply use your new-found floral design knowledge for your own personal enjoyment. Even though you’ll enjoy the convenience and luxury of studying in the comfort of your own home, you are never alone. The support of an instructor is always just an email away to students in good standing anytime you have questions, need clarification, or would like advice. We’ve been training students from all around the world via distance education since 1999 with great success. Our teaching methods work! With this one-of-a-kind training program, no previous experience with floral design is required. We’ll start you right at the beginning. And if you do have experience in floral design on an informal, self-taught, or hobby basis, this Wedding Floral Design Course will ensure that you learn the proper techniques, methods, and theory of professional floral design, to enable you to be the best designer you can be. When you’re learning about something you love and are genuinely interested in, taking a course is fun – it’s never boring, dull or tedious. So even if you were never a great student in school, you can expect it to feel different with this course. As you learn more and more, and you see your skills developing quickly, your excitement grows. And with that, your confidence in yourself as a designer will grow too. 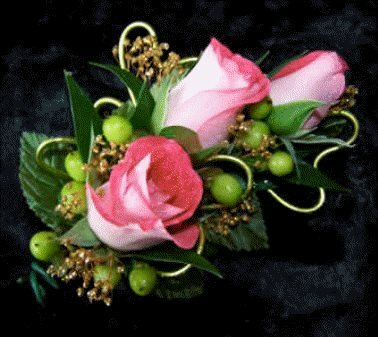 Rose Corsage Designed by One of Our Students for a Course Assignment. Floral design is a fascinating art form which has it’s origins in ancient history – people have been enjoying floral design literally since the beginning of civilization. It’s little wonder that humans have been drawn to the art of floral design and flower arranging for for so very long – it instills a sense of relaxation, it’s a wonderful creative outlet, and can be a rewarding, fulfilling, enjoyable way to spend one’s time. Many people enjoy floral design purely as recreation. But it can also be very profitable for those who choose to pursue it as a career or business, whether as a serious full time occupation, or simply to earn some extra spending money while doing something you really enjoy. For many, it is like living a dream to have the ability to to earn great money while doing something you’d happily spend your own free time on. When you indulge your creative instincts, it calms the soul, clears the mind, and lifts the spirit. By so intently focusing your attention on the design you are creating, you are taken into almost a meditative state, forgetting about life’s other pressures. It’s so satisfying to use your own creativity to achieve a beautiful end-result, and with that comes a rewarding sense of accomplishment every time – no matter how long you have been designing, or how many floral arrangements you have made in the past. And there’s extra special feeling of satisfaction when you know the designs you are creating are for the single most important day of someone’s life, their wedding day. All photos featured on these pages are of actual design work done by students of this Wedding Floral Design Course, based on the techniques, methods, and lessons they have learned in the course material. Enroll today and you’ll soon be designing gorgeous flowers for weddings using professional floristry techniques and methods revealed in the program.